Available as an 8" medium or deluxe 10" specimen model, the medium size is best suited to general angling for medium-sized species and can be used in boat and shore fishing situations. The longer deluxe 10" length is ideal for anyone who fishes for specimen big fish with big teeth, such as sharks, eels or smooth hounds. The multi-position tip enables the angler to push or pull the hooks with one simple movement to extract hooks from deep inside the fish's mouth and allows for safe return of your catch with minimum stress to the fish. Looking to buy some Disgorger / Baiting Needles / Elastic as part of a fishing gift? If you would like some advice on purchasing Disgorger / Baiting Needles / Elastic, simply contact our expert fishing team, giving us either an email or phone number on which to contact you and we'll get back to you right away with the best advice and prices. 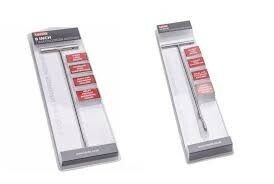 FREE Delivery on all Leeda Disgorger / Baiting Needles / Elastic over £100!! !